At the end of January, senior Belarusian officials made statements that threatened to undermine Belarus' good relations with the Vatican, severing ties that the country had worked for years to establish. Aliaksandr Lukashenka and the Commissioner for Religions spoke out against the presence of foreign Catholic priests, most of whom are Polish citizens, in Belarusian parishes, – a tradition has that existed since the USSR's collapse. Belarus has failed to create its own national church in the course of its history, and the authorities view the Orthodox and Roman Catholic Churches as foreign elements – one from the East and another from the West, – rather as a part of local religious traditions. With the war in Ukraine raging near its border and a presidential election coming up in autumn, the Belarusian authorities are seeking to establish tight control over domestic affairs, including religion. Catholics have a weaker position within Belarusian politics, while the Orthodox Church remains under Russia’s protection, and Lukashenka fears to confront it at a time when relations with Russia are strained. At a meeting with the Belarusian Foreign Minister on 30 January, the Apostolic Nuncio Gugerotti expressed his concerns about the “possible interpretation of recent comments about the Roman Catholic Church made by senior officials”. First, the Commissioner for Religions and Nationalities Leanid Huliaka on 22 January, and then Lukashenka on 29 January, spoke out against the service of foreign Catholic priests in Belarus. The shortage of local clergy has been the result of decades of the USSR's state atheism policy in Belarus. Belarusian officials called for the meeting, a fact that indicates that the Foreign Ministry is trying to smooth over Lukashenka’s most recent comments. Minsk has been expending a lot of effort into fostering good ties with the Vatican for years, as it still holds authority in the West and does not demand political reforms in exchange for working relations. For Belarusian diplomacy, losing these ties would signal a major defeat, something Minister Makej is acutely aware of. On 22 January the Commissioner for Religions and Nationalities Leanid Huliaka, a senior government official responsible for religious issues, criticised Roman Catholic priests at a government meeting on religious affairs. “Some priests from Poland are trying to get involved in politics here. They do not like our country, our laws, or our government. In these kinds of situations we should not allow them to continue serving in Belarus”, the official said. The next attack on foreign clergy came shortly thereafter from none other than Lukashenka himself. The Belarusian leader, during his record-breaking press conference on 29 January, said he is “not quite satisfied with the Polish priests working in Belarus”. Lukashenka did not want to specify the reasons for his dissatisfaction, only saying “they are doing the wrong things”. He also noted that more local priests should be trained in Belarus. 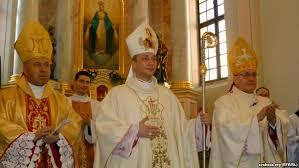 Currently, Belarus has 430 Roman Catholic Parishes, where a total of 430 priests serve. 113 of them have foreign citizenship, usually Polish, but their number is declining. In 2005, for example, Belarus hosted 202 foreign Catholic priests. This is a large share when compared to the Moscow-controlled Orthodox Church, where only 15 foreign citizens served in 2013 out of a total of 1,605. Nevertheless, according to Huliaka, the Roman Catholic Church fails to supply the necessary number of local priests to Belarusian parishes. The Hrodna seminary has 27 students and the Pinsk seminary even fewer – only 19. In 2014, these religious schools enrolled 2 and 3 students respectively. “It seems that the leadership of the Roman Catholic Church has no interest in training local priests”, Huliaka said. Belarusian priest Piotr Rudkoŭski, speaking to Belarus Digest, said that serving God is a calling, not a mere profession, so training new staff in the Church differs from training people for, say, state institutions. "Belarusian bishops, actually would like to have as many local priests as possible. The Church organises a lot of educational events to attract possible candidates, and parishes even have a weekly prayer for new people to become priests. Yet government officials look at the whole issue from a bureaucratic point of view, not a spiritual one", Rudkoŭski says. Roman Catholics – An Imaginary Threat? Belarus over its history has failed to establish a single national church. The Belarusian Orthodox Church is fully subordinate to Moscow, while Roman Catholics maintain close ties with Poland and the West in general. Powerful foreign organisations with influence on the minds of their congregations are an issue of considerable concern for the Belarusian authorities. This is especially true as of late. With the ongoing Ukraine conflict and upcoming presidential elections in November, the authorities need more control over society, and churches in particular. Although the Catholic Church has been pursuing a policy of Belarusianisation, and today most masses occur in Belarusian, Polish language still retains some influence and most priests from Belarus are educated in Poland. As Piotr Rudkoŭski shared with Belarus Digest, relations between the Catholic Church and the state maintain a shaky equilibrium. The state allows some autonomy in exchange for political loyalty, for which the church receives criticism from opposition-minded priests. Lukashenka of course remembers the patterns of voting of Catholics in Western Belarus, which showed the highest levels of support for the democratic opposition during previous presidential elections. However, the Catholic Church has not displayed any open hostility towards the government. The only known case occurred in July 2014, when the priest Uladzimir Lazar was taken to prison on charges of treason against the state. However, after spending half a year under investigation, he was released due to a lack of evidence. No other similar cases or open criticism of the authorities from Catholic priests are known. 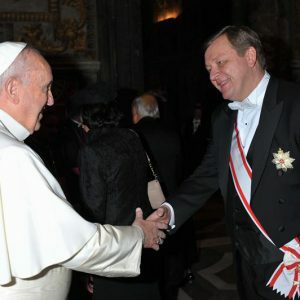 Belarus Changes its Strategy towards Vatican? According to Rudkoŭski, the Kremlin is interested in raising tensions between the Belarusian state and the Catholic Church. It seeks to hamper the trend of Belarusianisation within the Catholic Church and its impact on Belarusian society. Still, it remains unclear what leverage Russia has on this relationship. Relations with Russia are already too strained at the moment in both the political and economic realms. Another confrontation on a different topic will make the Belarusian side even more vulnerable. Meanwhile, less radical steps towards state control over religion seem quite acceptable, and especially with the Catholic Church, whose political leverage in Belarus is much weaker than that of Russia’s Orthodox Church. The Belarusian authorities have tried to use the Roman Catholic Church as an intermediary to normalise Belarus-EU relations, and Lukashenka has been expressing hopes to meet the Pope in Belarus a number of times. The pressure on foreign priests can bury these hopes for good, something that the authorities are well aware of. Lukashenka, in a fit of populist passion, seems to forget to be careful, leaving diplomats to sort things out.